As promised, here are some my favorite photos from 2013. It was really tough to narrow these down to 22 (it was going to be 21, but see below) out of the roughly 1,800 images that were “keepers” from my various photography jaunts this year. Of course, many of you joined in the winnowing process by helping me decide between two similar bison photos last week. Or at least that’s what was supposed to happen. Since the vote was nearly evenly split (and a lot of people voted “both”) I decided to include both photos. You’ll see them displayed back to back below. I hope you enjoy the photos. If you let the slideshow run on its own, it’ll take a little under two minutes to cycle through. You can speed up the process, if you like, by clicking on the arrows within the frame. If I had to choose a single favorite from the year, it would probably be the one below. It tells a great story without having to use any words at all. 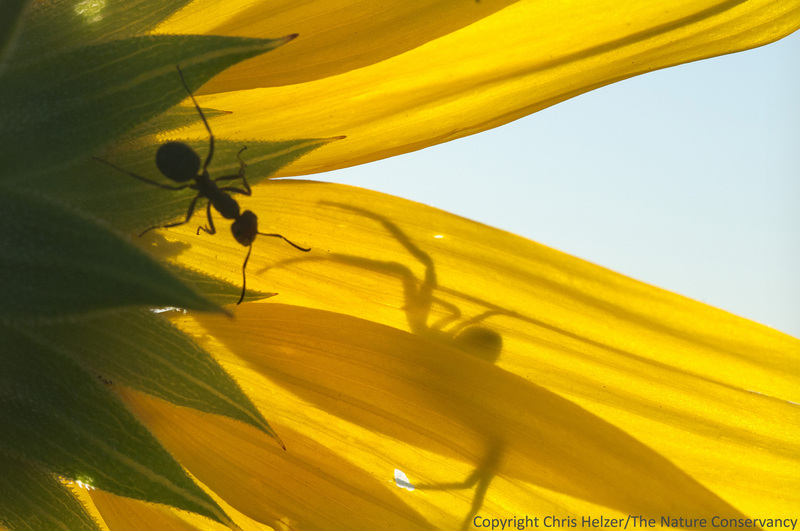 Ant and crab spider on an annual sunflower. The Nature Conservancy’s Niobrara Valley Preserve, Nebraska. I shot quite a few images of crab spider silhouettes that morning, trying to get one that was just right. I got some pretty nice ones, but none that were as striking as I’d hoped – until I was photo bombed by this ant. That’s often the way photography goes. Equipment and technique are both important, but you really just have to be in the right place at the right time. I’m looking forward to being in lots of right places in 2014.